I started reading folklore when I was a kid. I didn’t know it as “folklore,” I found a series of books that captured the “fairy tales” of different countries and continents. It was spellbinding. Of course, I was familiar with the European tales from the Brothers Grimm, and some Native American lore, but this series served up around twenty volumes of marvelous legends filled with creatures and monsters, heroes and heroines, magic and mystery. I was hooked. Step one in the making of a fantasy novelist. Around the same time, I discovered books of “ghost stories.” Some of these were legends, like the stories of the “woman in white” who is picked up on a stormy night as a hitchhiker and disappears from the moving car when they reach the destination—which is usually a cemetery or an abandoned house. Some were stories recounted by people who obviously had experienced something they couldn’t explain, and for which a logical explanation was hard to find. I ended up with a lifelong fascination with ghosts, haunted houses and the supernatural. Step two in my education as a future author. Books on magic weren’t quite as easy to find when I was growing up as they have become since Harry Potter. There were storybooks that sometimes had a wizard or a sorceress, and more serious books for real practitioners. I read everything I could get my hands on, completely intrigued. Step three in the development of a fantasy writer. As I got older, I grew into reading mythology and theology, the quest to explain the inexplicable. I was riveted by the stories of gods and goddesses, of their champions and enemies, their triumphs and failures. And I was equally struck by how often the same themes were repeated and how similar the stories were even though separated by millennia and continents. I could close a book of mythology when I was done reading and feel like I had been transported to another realm. It was like flying. I knew that someday, I wanted to tell stories like that. My fate as an author was sealed. Along the way, I took every course I could on world cultures, history, anthropology and world religions. I wanted to understand—or at least be exposed to—how people across many cultures, time periods and locations tried to understand the unknowable. I delved into Joseph Campbell and Caroline Myss and their work on archetypes and the hero’s journey. It was a rich, varied and complex river of ideas, a deep well of inspiration. To this day, after nine epic and urban fantasy books (and more in development), I go to that well time and again for ideas, concepts and archetypes. When I visit a new country or a new city, I want to see its architecture and monuments, but I also want to hear its legends, learn about its ghosts, and tour its holy places and burying grounds. Stories, legends, myths and folklore endure because they speak to something deep inside us, something common to the human experience that is independent of place and time. We have been telling these stories, in one variation or another, since the dawn of time. And as a writer, it is my thrill and privilege to be the next link in the chain that takes these stories forward to the future. I love readers, bloggers and book reviewers! You’re the reason writers get to keep on writing. Whether you share your book recommendations in conversation with friends or informally on social media, post them to Amazon, Goodreads or other online book sites, or run a book review blog, you’re filling a valuable gap between publishers and readers—and a gap which old-style media like newspapers (do they still print those?) and magazines have pretty well abandoned. Thank you reviewers and readers! Historian Bruce Catton, in one of his many books about the American Civil War, notes that civilization is a mask, and war gives permission to remove the mask and reveal the beast that always lurks beneath. I wager that one reason post-apocalyptic stories are so enduring is that the end of the world is one of those times when you find out what you—and your neighbors—are really made of. 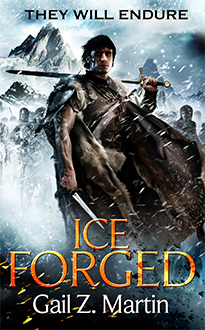 Ice Forged is a post-apocalyptic medieval adventure, set in the unlucky kingdom of Donderath. A devastating war with its neighboring rival has the unexpected—and unintentional—effect of destroying the bonds that made magic a power that could be controlled by people. Not only is the kingdom devastated by fire and storm, but the magic upon which their culture depended is now no longer controllable. In the chaos and anarchy that follow, my characters not only find out what they’re made of, but they discover a world that is now theirs to remake. Of course, they’re not the only ones who have ideas on what the new reality should look like—and that’s when things get interesting. Whether you call it Catton’s “beast,” Freud’s “Id” or Jung’s “Shadow,” there’s always tension regarding the choices to be made. Perhaps Dumbledore said it best when he talked about the choice “between what is right, and what is easy.” Or maybe Babylon 5 was onto something in the dichotomy between the Vorlons, who asked “Who are you?” and the Shadows, who asked “What do you want?” When there are no rules, no law and no social constraint, men (and women) either rise to be the hero, or sink to their baser nature. Lord of the Flies is always just one catastrophic power grid failure away. 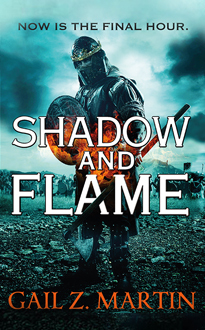 Blaine McFadden, in Ice Forged, is acquainted with his shadow side. He killed his father, a minor lord, to stop him from abusing Blaine’s sister. 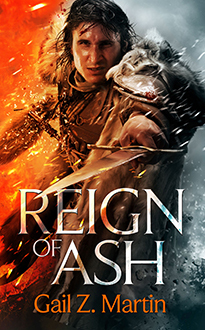 Blaine expected to die for his crime, but the king was “lenient” and sent Blaine instead to a brutal prison colony in the arctic north, a place from which no one ever returned. 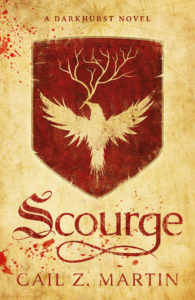 Blaine survived six harsh years, first as an inmate and then as a convict-colonist, during which he learned just what he was made of and what he would do to survive. When the homeland is destroyed and magic fails, Blaine discovers he might be the only one who can restore the magic and put things right. He’s got a choice to make. 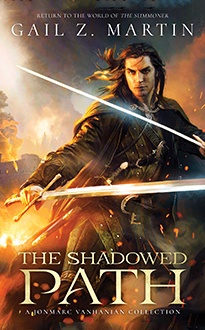 In Donderath, there is no king, no surviving noble heirs, no army—and no magic. Buildings that had been patched or reinforced with a bit of magic crumble, even if the wild storms and Great Fire don’t destroy them. People and animals sicken, crops rot in the field because the men went to war and didn’t return, and the sea wall, strengthened by magic, collapses and drowns half the city. Uncontrolled magic “storms” cause death and havoc with erratic bursts of power, spawning strange beasts that deserve the name of “monster.” Villages are abandoned as people flee, and travelers become fair game for roving bands of brigands. The shadow side is ascendant. 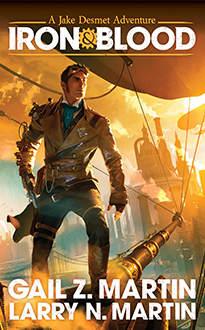 Blaine and a small group of convicts return in hope of restoring the magic. They’ve faced their shadows in the chains of Velant, but in the wreckage of their homeland, there’s a new darkness to be reckoned with. A leaderless kingdom is the type of power vacuum that draws dangerous opportunists, some of whom like the fact that magic doesn’t work—and want to keep it that way. And Blaine must reckon with the shadows of choices, sacrifices and temptations to see his quest through—or die trying. 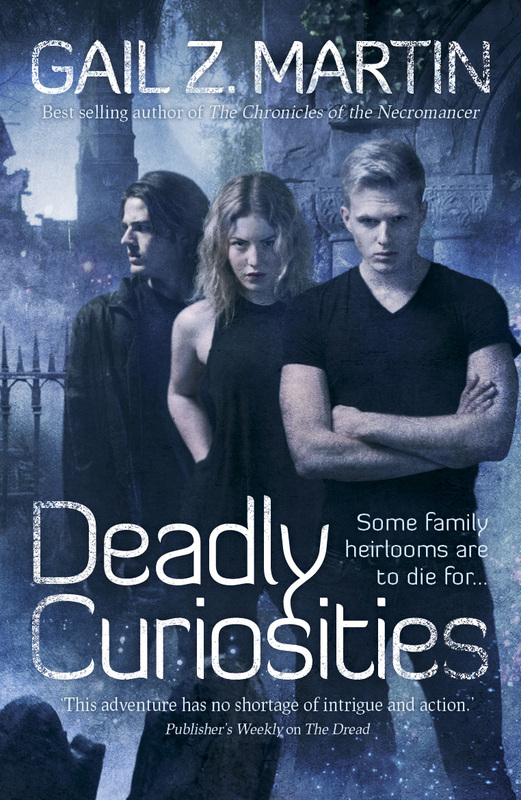 As part of the Deadly Curiosities launch, I was fortunate to be a guest blogger for some really awesome blogs all around the world. Some wanted me to talk about a specific topic, others had questions for me, and still more wanted me to say whatever was on my mind. In case you missed it, here are links to the interviews and musings—there’s stuff in here you won’t see anywhere else! Deadly Curiosities hit the ground running! Not to mention two different Deadly Curiosities excerpts! 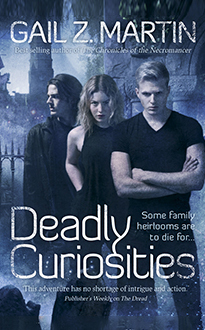 There are two new Deadly Curiosities Adventures short stories, Wicked Dreams and Collector—a great way to stay in touch with the characters until the second book comes out! Wicked Dreams: Inexplicable murders among King Street merchants look like the work of a long-dead serial killer. Cassidy, Teag and Sorren go looking for an undead slasher before the body count rises. Collector: A Collector’s passion brings death and despair to Battery Row. 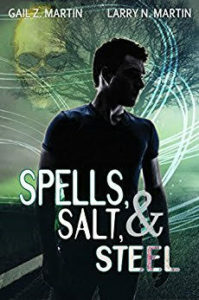 Cassidy, Teag and Sorren fight for their lives against an ancient spirit, a children’s bogeyman, who has brought her minions with her to help discipline all in her path. Next up–I’ll be in England, Wales, Scotland and Ireland in the next couple of weeks–look for me to do a signing at Forbidden Planet in London on 7/23, at Waterstones Cardiff on 7/31 along with Lou Morgan and Gareth Powell, and keep your eyes open for something in Edinburgh too! Had a wonderful time at ConGregate! Next up is Dragon*Con, then ContraFlow in October, followed by a hat-trick trifecta of November cons: World Fantasy/Atomacon/Philcon! Hope to see you soon! 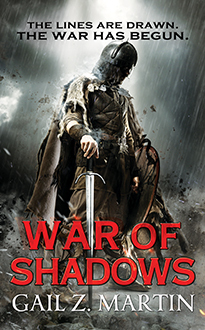 Epic fantasy usually deals with the sweeping repercussions of events and decisions—the wars, assassinations, dynastic conflicts and economic collapses that change the balance of power. Certainly anything worthy of being called an apocalypse affects the superstructure of society: government, commerce, economics, and technology. Add in plague and natural disaster and a nation, continent or kingdom loses a significant portion of its workforce, its intellectual capital, its history and its physical infrastructure. Those losses are guaranteed to change what daily life is like for the survivors, and to make just getting by much more difficult. Yet for individuals—whether real people or book characters—sometimes the big losses seem distant and abstract and it’s the small losses that drive home just how much life has changed and what is gone. In Ice Forged, characters mention what they miss, little things like memories of how holidays were celebrated and favourite foods that are now difficult or impossible to get. Perhaps it’s the realization that the landmarks—like a castle or the main street of a city—that seemed immutable are now ruined. It’s the dislocation of war and cataclysm that causes long-time neighbours to go missing, and the people you always met in the course of your daily life to vanish. Or it’s discovering that with crops unplanted or unharvested and distilleries and vineyards ruined, there’s not going to be any new good wine, ale or whiskey any time soon. In “Hitchhiker’s Guide to the Galaxy,” Douglas Adams advised readers to “Always know where your towel is.” Perhaps he should have included some Charmin, just in case. The idea of writing as therapy isn’t new, nor is the idea of writing as exorcism. Writing is generally cheaper than hiring a therapist, easier than hiring a priest and doesn’t fill the house with the smell of incense (usually). It’s all fun and games until someone’s head swivels around backwards. My writing has helped to quiet the ghosts of the past in several ways. After my mom had a devastating stroke, I wrote an as-yet unpublished novel about the experience, based on an off-handed comment a family member made that suggested an ideal—if illegal—solution to the quality of care issues she was encountering. I didn’t act on the suggestion, which was made tongue-in-cheek, but I did write about it, envisioning how things might have turned out differently. I’m still debating what to do with that book, but I remember how quickly the book wrote, and how unusual it was to be typing as I cried (fortunately I’m a touch typist). That book may or may not make it to print, but it was cathartic for me to write it. The novel didn’t have a happy ending, and neither did real life, but having written a version of what could have happened in advance; I was somewhat better prepared for what did happen. So it served its purpose. My relationship with my dad was, shall we say, complicated. It did not occur to me until this year that in all four of my series, the main character also has a complicated paternal relationship. I swear I didn’t do that on purpose. I wasn’t even aware that I had done it until I suddenly saw the pattern. I am now working to consciously create different patterns for future characters. I guess I have issues. When my dad passed away, I was the executor, so handling his estate and the remaining collections fell to me, on top of publishing deadlines and other work. Writing the books and short stories became my little port of sanity in a stormy ocean of legalities and paperwork. It’s taken most of a year to resolve everything, during which writing has become my rabbit hole where I can escape. There are probably other ghosts that either haunt my writing unacknowledged or that have been exorcised, but if so, they’ve agreed not to break the dishes and I’ve agreed not to call the exorcist (or Ghostbusters). I suspect that most writers’ brains could keep a good paranormal investigation team busy for a long time. Coincidentally, I’ve never met a successful writer, artist, comedian or musician who had an idyllic childhood, and I suspect the two are inversely related. Dysfunctional families are the gift that keeps on giving. People think of Voodoo when they think of New Orleans, and they may think of ghosts when they think of Savannah, but Charleston not only has ghosts galore, bit also has Hoodoo (Conjure) and in Deadly Curiosities, a strong dollop of Voodoo as well. Voodoo is pretty much a Hollywood creation, so in Deadly Curiosities, I talk about Voudon, the proper name for a Haitian religion that melds beliefs from Africa and the Caribbean. Voudon practitioners see themselves surrounded by hundreds of loa, powerful spirits with the ability to bless or curse. Since slaves were forbidden to practice anything other than Christianity, many enslaved people matched their loas to Catholic saints and continued their beliefs under cover of a practice that incorporated elements of both religions. Female Voudon priests are mambos, male high priests are houngans. Voudon is closely identified with New Orleans but would likely have been practiced by slaves who came from the Caribbean no matter where they were taken to reside. Hoodoo is a form of folk magic with deep roots in African, European and Native American beliefs. It grew and changed, adding elements from the cultures it touched in the Caribbean and in the deep South. Hoodoo is also sometimes called “conjure”. Practitioners are often called “root doctors” or “Conjure men (or women)”. Much of Hoodoo involves cursing someone (“putting a root on them” or “crossing”) or lifting a curse that has been laid. Hoodoo often uses special powders and charms to protect against being crossed. Candles, plants, even bits of hair or nail clippings can all be used by the root worker to bless or curse. Hoodoo is often associated with the South Carolina Lowcountry region and the Gullah people (descendants of freed and escaped slaves), but it was also practiced throughout the Southeast. So how did I end up with Voudon in Charleston? It’s not a stretch when you realize that by some estimates, 40 – 50% of all U.S. slaves came through Charleston. Some came directly from Africa, others via the Caribbean. About 90% of those slaves went beyond the state’s borders. It stands to reason that there would have been a fertile—and furtive—mingling of beliefs and incorporation of new practices as slaves brought their own traditions with them and bumped up against the traditions of others with whom they lived and toiled. Another path for Voudon to come to Charleston would have been through the slave owners who moved back and forth between the South’s major cities, often bringing their servants with them. Whether they came for a visit, for business or for marriage, it seems very likely that Charleston slaves would have had ample opportunity to be exposed to Voudon—if not from their own traditions, then from those of other slaves brought to the area. Many historians also cite examples where slave owners adopted and adapted some of the magical traditions of their servants, practicing Voudon or Conjure quietly themselves, or asking for the help of practitioners when their needs exceeded what the Church could supply. Using Voudon and Hoodoo in Deadly Curiosities helps to establish the setting in a very vivid way. I am well aware of the fact that both belief traditions have been badly misconstrued by Hollywood, and I have done my best to search out reputable sources and to represent both Voudon and Hoodoo with the respect they deserve. Both are belief systems with many modern adherents, and I want to be respectful, while using some editorial license for dramatic effect. While Voudon and Hoodoo play a big role in Deadly Curiosities, they aren’t the only forms of magic readers will encounter. Sorren, the nearly 600 year-old vampire, brings magical items from several European traditions, including pieces from a Norse Seior who was a protectress centuries ago. Teag draws on protective amulets that include a Filipino agimat and a Greek hamsa. Relics from Catholic saints and medallions of the saints also figure prominently. Expect to see more magical items from additional traditions figure in as the stories unfold. The people who settled the U.S. came from around the world and brought their traditions, beliefs, religions and superstitions with them. We recognize the U.S. as a “melting pot” of influences, giving the world things like taco pizza and southwestern eggrolls, but often forget that thanks to close proximity, intermarriage and long-time exposure, cultures that might never have borrowed from each other in the Old World took what they found useful and adapted it to their own beliefs and needs. In other words, we all stole liberally from each other when it came to language, folklore, food, music and magic—and came up with new stuff that is often pretty amazing. Sit back and enjoy the ride—there’s more than enough magic to go around.